At 10-years-old because we still lived at the same address it also saw me attending and assisting at all three parish churches. Saint Theresa’s parish was in real bush country with only one winding dirt track that went in and came out the same way. People came from miles around to fetch water at the only piped in water tap in the church grounds. They came by horse and cart, donkey cart, and some even brought wheelbarrows or any other homemade contraption that could convey water. Sundays were like an outing with a real picnic atmosphere when parishioners and others came to mass, and to fill up their water containers. In those days you had to fast before receiving communion so everybody brought breakfast and lunch and just stayed for the day. Mothers cooked on open fires in the shade of the trees, fathers with axe and saw felled trees and cleared shrub within the grounds, and older children filled up water containers while the younger ones were either attending Sunday school or playing sporting games. Saint Joseph’s was an African parish, and it always amazed me to hear an Irish priest say mass in Latin and preach his sermon in the Xhosa or Zulu language. The congregation were just as bilingual because they could hlabelele (sing) and pray in Zulu, and also Xhosa, English and Latin. It was always thrilling for me to attend church services there, and the reason was that they sung in their melodious African voices with an occasional foot stomping punctuated with thunderous clapping. My smattering of the Xhosa and Zulu language use to annoy my family because I practiced it verbally out loud, and also my singing of the African anthem of ‘Nkosi Sikelela I Afrika’ (‘God Bless Africa’) taught to me by the Langa African youth, but I use to ignore them for it helped my communications skills with the African people. Another African tradition that drove my parents crazy and earned me the nickname of Zulu from by sisters was because of the umxhentso (Xhosa = traditional dance) of the Xhosa. It would see me doing the rhythmic movements, feet stomping and various gestures that went with it whenever hearing African music emitting from the radio, which was far and in between. But when in Langa amongst the Africans at any of their celebrations, their singing melodious voices punctuated with clapping by the women and girls got me into the thick of their dancing. Just imagine me as the only non-African person amongst them and bare-footed as they were kicking up the dust in a back yard or out in the open with encouragement from them. It also gave me an advantage over others who never had the chance to experience an association with them and their culture first hand at an early age. That African township of Langa was the only one in the whole of Cape Town at that time, and their survival skills under dire conditions was an eye opener and a learning experience. Another unusual and not so difficult learning experience was the click sounds of their language. The clicks in the African language are sounded in the letters c, q, and x. C – tut–tutting click sound, a dental click produced by pressing the tip of the tongue against the upper front teeth where those meet the gums and rapidly pulling it away with that sound. Q – Champagne cork popping click sound, a palatal click produced by pressing the front part of the tongue against the hard palate behind the front teeth and rapidly pulling it away with that sound. X – Cantering horse click sound, a lateral click produced by placing the side of the tongue against the upper side teeth and rapidly pulling it away with a clucking sound. Although their box type units were uniform and crammed together, their well-kept flower strewn gardens and the constant whitewashing of their khaya (home) in different colours gave the town a rainbow effect. Tin roofs, cement floors, bedrooms were just that for it could only accommodate an ibhedi (Xhosa = bed), and a bucket toilet in the back yard was the package. One paved indlela (Xhosa = road) ran through the town with sparse street lighting and dirt tracks served the rest. Single dormitory type units for men with bunk beds were situated away from the family homes, and a packing crate served as a cupboard, chair and table because of them having to live out of their suitcases. Those units were for both single and married men who had left their homelands in the Transkie to work in the city to support their families, and they returned once or twice a year to their homeland to visit, plow the fields for harvesting and to make more babies. Their homes there of rondavels where they slept on mats, sat on the ground and fetched water from umlambo (Xhosa = rivers) and streams must have been a huge contrast to those who came to live and work in the city for the first time. The traditional thing that they adhered to though was the three legged potbelly pots used for cooking on open out door fires, and that also served as heating purposes. The bhema (smoke) that curled up constantly from the many cooking fires in the town was nothing compared to the pungent smoky smell that emitted from the masipala (municipality) refuse dump back of the township where the surrounding suburbs trash was dumped and burnt. They not only had to contend with their inadequate living conditions and standards, they also had the stench and constant smoky haze that engulfed them. Been paid a pittance for their labour, which they had to be financial geniuses to calculate outcomes to survive, and having to first distribute their meager wages to a government pool tax, municipal rent, work traveling expense, monies sent to homeland families and savings to return back there made for very little sustenance. Their diet consisted mainly of mieliemeel pap (Dutch = maismeel pap, cornmeal cereal) eaten as a thick porridge, and offal. The odour from their cooking pots were at times not very savoury due to a skaap kop (Dutch = (schaap kop), sheep head) or a koe kop (Dutch = cow head) being cooked, and although a necessity was also a delicacy. Chunks cut out were consumed with the porridge, baked sweet potatoes, whatever uhlaza (vegetables) were available, sweet black khofi (coffee) and thick slices of buttered bread, and it tasted delicious. Their eating of tripe was an art form though. When cooked it was cut into strips and then with one end inside the mouth clamped down by a set of immaculate white teeth, which they cleaned after every meal with ash and water by using the fingers, the tripe was held taut. The protruding tripe was then cut off close against the lips with a sharp fine edged, pocket mese (knife). The titbit was consumed and the procedure continued. I on the other hand didn’t try that. Menial work was their lot; yet with cunning they provided extra perks for themselves. Some employed at the abattoir’s brought out all sorts of meat cuts concealed in the trouser leg of their overalls that were tucked into gumboots. It occurred during their lunch breaks, and their waiting customers that were mainly African umfazi (Xhosa = women) concealed in bushes nearby would receive the meat, take their daily needs and sell off the rest, and I observed those transactions when working at a suit case fektri (factory) that was in close proximity to the abattoirs in Ndbeni. As garbage collectors they collected an array of sale-able articles when garbage bins were not so sophisticated as they are now. They were just a homemade-lidded tin affair. The refuse was tipped out onto a large canvas square that was gathered together and taken to the next house where the procedure was repeated until filled. It was then taken and emptied into a horse drawn garbage truck, and from there the refuse could be scrutinized from pick up to disposal which gave them first pick of resalable articles that never made it to the tip. Delivering early morning ubisi (Xhosa = milk) got extra in the pocket too. Only Africans were employed to deliver fresh bottled milk daily to household customers because of their strength and dexterity in handling an over filled milk-crated bhayisikili (bicycle). Hugh pigeonholed wire compartment crates were secured to the front and back of a delivery bicycle and filled to near overflowing with bottles of milk. Their skill at mounting and dismounting those laden bicycles were unbelievable because it couldn’t be done while stationary because of the uneven heavy weight at the front and back that would cause it to topple over. The solution they employed was to grasp the handlebars, push and run at a good pace and then jump on. To dismount they slowed down, jumped off and kept the momentum going by continuing to run alongside the bicycle to control it before stopping. We relied heavily on them because home refrigeration was an expensive commodity and milk had to be used on a daily basis. At times though we had late deliveries and it was all due to, as told by our milk deliverer, the losing control of his heavy load on our rutted roads whereby having enormous breakage and spillage. He had then to return back to the depot to pick up another load. What he didn’t tell us, although we knew of it already, was that occasionally before the crash three quarters of the load was emptied into milk cans at a friend’s place in the early hours of the morning. A few of the delivers were then made before the rest of the empty and full bottles were smashed on the roadside to give an effect of an accident. As evidence he took bits and pieces plus limp or self-inflicted scratches back to the depot. Nobody ever doubted or checked the story there and nobody ever refused to buy milk at half price. Others employed as night watchman / security guards at factories earned extra by either looking the other way or involved with pilfered goods. A security guard had the right to search any bags you carried through the factory entry gate when leaving a factory at lunchtime and knock off time. Articles required for yourself or others that were difficult to purchase or produce was easily obtained by chatting to the guard, slipping him some cash, tobacco or cigarettes, and walking through the gate meant him only giving a quick glance into your bag. There were other times though when larger or complete products were driven out through the factory gates on the factory owned dump truck by the watchman / security guard who had also done the packing. Before there were industrial bins, raw material off cuts were accumulated and stored in hessian bags and metal drums on a special factory dump truck. When packed to capacity all of the scraps were either taken to the tip or metal scrap yard and other recycling outlets. The ill-gotten goods were packed and concealed amongst the piled high scraps on the truck and were then unloaded and picked up at a designated point. I worked at one of those factories and saw it in operation. Stevedoring was another way in which extra would be obtained. Shift gangs did the loading and unloading of ships at Cape Town docks, and meals while working there were never a problem. It was amazing what foodstuff could be taken from ship galleys, larders and fridge stores, and stuffed down an ihempe (Xhosa = shirt) or overalls. The best meat cuts and vegetables were used to cook a stew during stand down times, which was in between unloading and reloading a ship. Never did we also have to take a cut lunch, especially with freshly baked, ship’s isinkwa (bread) that was pilfered to go with barbecued steak, chops and sausages. Occasionally those menu meals were washed down with whiskey that was obtained from the wooden casks in which it was stored in as ship’s cargo. It was a simple matter to remove the bung, fill up a bottle each, replace the whiskey with water, and South Africans that could afford it consumed re-bottled water diluted whiskey, and yes I worked as a stevedore during my Merchant Navy trips. Ship’s cargo was pilfered meticulously with lookouts posted as an extra precaution, and all sought night shift. Bulky ship’s cargo could be carried out within overalls and under raincoats pass the security guards at the harbour entrance gates without a challenge, but on one occasion though they had a sudden wake-up call while dozing in their sentry guard boxes. Part of an alarm clock cargo consignment had been gotten into, and after securing the clocks on us departure was a formality. However, a first time young African stevedore had wound up all of his to see if it worked, and as he approached the gates one of the alarm clocks went off, and the alerted guards each received a brand new clock that night. Those and other misdemeanors were not only prevalent amongst Africans but all races. The fairer the skin colour the higher the echelon that made it comparatively easy to manipulate the system for unlawful financial gain, and the Afrikaners were a good example of that. The African males skill with a knopkierie (Dutch = knob, Khoikhoi = (kirri) club) that was a long balanced throwing stick with a rounded protuberance at one end, made them the ideal choice as railway station policeman. They were able to accurately throw those from a distance to trip up a miscreant, and it was a most quelling form of defense if their adversary produced a weapon. The knopkierie, the assegai and the reinforced wild buckskin shield were the only weapons used by the African tribes when waring against each other, and also against the Boer and the British. Free train rides, boarding and disembarking from a moving train, jumping off station platforms to climb over railway fences for a quick exit, crossing from platform to platform across double railway lines instead of crossing over the railway station bridge, drunkenness, rowdiness, swearing and fighting were theirs to deal with. Fighting on railway property lead to arrest but others that occurred off was not interfered with, and there were some beauties. Stick fighting between opposing African tribe individuals were frequent, bloody but entertaining. They carried their fighting sticks hidden, and when challenged removed an outer top of clothing to wrap around the hand and stick that was grasped in the middle. That was the defense stick used for parrying blows and the wrapped clothing was for hand protection. The other stick was for attacking and various techniques were implemented. Deft footwork, body swaying, ducking, weaving and feinting to strike a telling blow, and when landed was punctuated with a loud African exclamation, and concluded only when blood was drawn. Other fights that broke out between the rougher non-white elements were more vicious. Individual or group members of various gangs with ongoing disputes on confrontation when coming from work via the train settled with each other spontaneously. Fist fighting was not the only option. They would use knuckledusters, bicycle chains, point studded belts that they all wore, or anything else that would inflict pain. At times knives were produced but that was more for effect, especially if somebody was losing and wanted to make a hasty retreat, because carrying any knife was illegal and attracted a heavy fine, and all that and more was observed by me over our back yard fence in safety. Africans won my hlonipa (respect) through my association first with their children and then their parents and elders. They had a wonderful curtsy that was portrayed even if they didn’t know me with a sawubona (good day). Their customs and rituals in comparison to eastern and western culture were to be admired too, and their amiable disposition, placid manner and respectable behaviour were commendable withstanding the suppression and oppression they had to endure. Where I drove my parents crazy with my persistent questions and exuberant behaviour their children were seen and really not heard by their parents. Questions were not asked, and only information relevant to the children’s upbringing was imparted to them with the rest learnt from the parent’s good behaviour. I actually learned more of the various African tribes’ history through them than at school, and it use to annoy me no end and get me into trouble when contradicting the teachers that taught the Afrikaner doctored South African history to us at school. What didn’t seem to be understood was that even if they had a different culture they were still human beings that required basic human needs, and given the opportunity from the onset they would have been found to be just as capable as anybody else. But because they weren’t thought of and even classed as citizens it gave them an inferiority complex, plus they were oppressed in a system regulated by the Europeans for centuries to keep them in that position. Part of the Xhosa, Zulu, Basotho, Swazi, Ndebele, Venda’s and other tribes history and culture was told and taught by African tribes elders storytellers to groups of the Langa Township’s enthralled children so as they would remember and be proud of their ancestors, and with me included as their ngane (friend) was my way of also been educated to the truth. King Ngubengcuka united the Xhosa clans I learned, and they established themselves in their kingdom of Thembuland, (now Eastern Cape) of which the Thembu is Nelson Mandela’s clan. Nevertheless, along came the Boers and seized the best agricultural and cultivation land followed by the British who divested them of their royal rule. That made it also an easy matter when the Afrikaners came into power during apartheid to carve further from those Xhosa lands the Homelands (A government restricted designated area where different African races were forcible dumped) of Transkei and Ciskei. Those who maintained a traditional lifestyle wore dyed clothing of red, orange or blue complimentary to their clans with cultural bead-work and jewellery, and tradition also extended into marriage customs and rituals. The lobola marriage custom, which I found intriguing in comparison to our mode of marriage, was one where the groom’s father usually paid a dowry in cattle, and although their own people saw women as second-class citizens, a father would increase his wealth throw lobola. Girls before reaching womanhood for marriage went through a ritual that saw them at puberty confined in a darkened hut, and while unmarried wore short skirts that was worn longer as marriage approached, and when married wore long skirts and covered their breasts. Where western women wore makeup as a beauty aid and a variety of hats to set off their features they used white clay on their face as beautification, large turban like hats, and to set it off smoked long stemmed pipes. The white clay was also used on pubertal boy’s bodies as a means of disguise during a three-month initiation period following their circumcision when women were not allowed to see them. The circumcision ceremony in their tradition differed from the Jews and Muslims as a religious ceremony because it prepared the mfana (boy) for manhood in his society in the areas of marriage, to officiate at tribal ceremonies and as his father’s heir. One of a strong but not so unusual belief was witchcraft that was rife in South Africa no matter what the culture or religion was, but to them there was a real fear of being possessed by depraved spirits such as a tokoloshe (small impish creature), and that’s why witchdoctors had a thriving business. The Zulu clan became a large dominant tribe under the warrior leader Inoksa (King) Shaka in what was Zululand, (now KwaZulu-Natal) and his half-brother Dingaan was the leader of the massacre at the Battle of Blood River of 3000 of his followers by the Trek Boers (Dutch = Migrating farmers) in retaliation of the slaughter of Piet Retief, which was one of their leaders that were conning the Zulus out of their land. The Boers after that battle established their republic of Natal, and by appropriating whatever land they wanted, pushed the Zulus further inland. The British when coming to the rescue during the Anglo-Boer War saw the English people settle there and continue using that land as if it was theirs, which again when the Afrikaner National Party came into power their apartheid laws herded the Zulus into their declared Homeland of KwaZulu (Land of the Zulu) in Natal. As with other tribes, birth, puberty, marriage and death were marked by ceremonies, and clothes also reflected their age and status but with a slight difference that animal skins were worn to reflect that, and a leopard skin worn signified a chief. In both the Boer-Zulu Wars and Anglo-Boer Wars it must have stirred apprehension and fear in both those sides when seeing thousands upon thousands of Zulu warriors approaching to do battle dressed in animal skins while rattling their spears against held shields while stomping the ground with their battle dance and chanting in one voice their battle songs, which was how it occurred. The same approach can still be witnessed today, and the power of it vibrates through you in demonstrations at functions. The Basotho lived in Basutoland, (now Lesotho) under King Moshesh the Great in its mountainous region. With a good economy of cattle and cultivation on its vast plains, the Voortrekkers (Dutch = before migrators; disgruntled Dutch migratory settlers from the taken over British conquered Cape Colony) forcible encroached on their land with a follow up by the difaqane (forced migration) from the conquest onslaught of Shaka’s impis (warriors). But because of moving his people to the mountaintop of Thaba-Bosiu, which became their fortress stronghold, they not only survived that entirely but also a further Boer takeover of their fertile land with the aid of the British who annexed Basutoland to the Cape Colony. The benefit of that when the Union of South Africa was formed (1910) saw it not included because it was a British Protectorate, and it was not affected by the apartheid laws of the Afrikaner government so as to be declared a Homeland even though it had the distinction that it was smack bang in the centre of South Africa. There traditional culture also consisted of customs, rites and ceremonies with the Xhosa’s tokoloshe thrown in for good measure. Their worn traditional garment of the all-purpose colourful wool and mohair blanket was a work of art, but the distinctive feature of their dress was the Basotho hat that was conical shaped with a top adornment that was a replica of a hill in the shadow of King Moshesh the Great’s Thaba-Bosiu mountain fortress as a sign of respect to him. The Swazis of Swaziland fought hard and long in keeping their territory out of the hands of the Boers, British and Zulus, especially because of their southern border then having been Zululand and the east of Transvaal, (now Mpumalanga). After King Mswazi, who the Swazis took their name from, retreated with his nation further north from the invading Zulus, and the British who defeated the Boers in turn defeated them, Swaziland too became a British Protectorate and didn’t suffer the apartheid laws of having been declared a Homeland. Because of that a monarchy still existed with a royal military regiment that held the nation together, and they were able also to carry on their old traditions unhindered. As a nation, respect for the aged, ancestors and tradition played a large part in the structure of their society. They had two important annual rituals that drew the nation together, the Incwala (First fruits harvest) that saw the king and his subjects participate in a ceremony that began the eating of the new year’s crops, and the Umhlanga (Reed Dance) that signified a ceremony for marriageable young Swazi women and a showcase for potential wives for the king. Tradition with the menfolk involved even those employed in business because they even wore traditional robes when going to work with briefcase in one hand and a spear in the other, which could have also been due to just in case they were attacked by wild animals on the way. The Ndebele who settled in the area of Transvaal before the Boers and the British even knew that that part of Africa existed were descendants of a fighting force of a Zulu renegade regiment that became a feared fighting force. Despite the fact that they were no match for the Basotho who held them in check, the Voortrekkers grasping for more land forced their leader Mzilikazi to withdraw further north into Rhodesia, (now Zimbabwe). Those who remained through unforeseen circumstances soon felt the brunt of the Boers who used them as slaves, and when Homelands were established they were placed as in all African ones in typical arbitrary and improvised locations, with theirs as KwaNdebele, (now Mpumalanga (Coming out of the sun). They had a similar culture to the Zulus with the exception of their dress that took on elaborate costumes and decorations. The women wore more than the men with their dazzling bead-work and jewellery, and the masses of copper rings worn on the ankles and around the neck were for a lifetime. Another difference was their strikingly geometric colourful painted houses that were usually done for special occasions such as on the return of initiated young males. 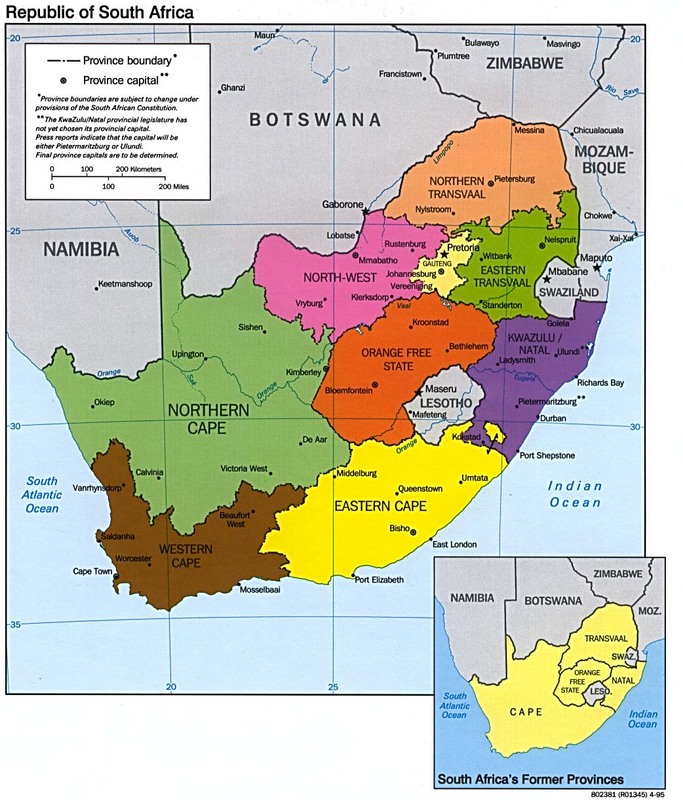 The Tswana of Bechuanaland not only dominated large parts of that country but also the Transvaal, (now North West and Northern Province), and north of the Cape Colony, (now Northern Cape). Although they didn’t come up against Shaka’s Zulus they were devastated by the Ndebele led by Mzilkazi, and the north trekking Boers took advantage of that by moving into and onto their land. The Tswana first rallied and fought back against overwhelming odds, but when seeing that they were fighting a losing battle petitioned the British for protection against the Boers, and they received like the Swazis and Basotho the establishment of the British Protectorate of Bechuanaland, (now Botswana). Those Tswana people who fled the Ndebele into Transvaal also suffered under the rule of the Boer, and when the Afrikaners established the Union of South Africa after the Anglo-Boer War they were forced to work in the gold mines and industries of Johannesburg as cheap labour. And that too eventuated into them enclosed in the Homeland of Bophuthatswana that like the rest were based on the existing British Protectorates but by the Afrikaner National Government’s rules. That particular Homeland was set up conveniently in a scattered arch of enclaves that bordered the Orange Free State, (now Free State), and Transvaal (now Gauteng (Sotho = Place of gold), but that originally consisted of North West, Northern Province and Mpumalanga, so that the African cheap labour workers could be on the beck and call of the Afrikaners of their two state strongholds. Even though denigrated in that capacity, the Tswana peoples not only continued their particular traditions but also were astute enough to improve on their knowledge of mining and metal production, which had always been part of their copper manufacturing skills, gained at the mines. Their trying also to establish some sort of independence under a tyrant government and harsh conditions caused them to set up towns comprising of up to 10 000 people who lived in self-built homes and developed an in home political structure. The Venda’s who consisted of the Lemba and Senzi people originated when they established themselves with Chief Dimbanyika as their leader in the Saltpans Mountain Ranges of Northern Transvaal, (now Northern Province), and named it Vendaland (Pleasant Land). Then came the Boers, the Swazis and the Tsonga tribes to take over their land; nevertheless, they succeeded to hold them off due to them grouping together, the mountainous terrain, geographical isolation and the tsetse fly, which transmitted sleeping sickness in humans and disease in cattle. The Boers mentality of thinking that there was more to the land because of their defending of it made another assault with about 4000 men. Fortunately or unfortunately the second Anglo-Boer War occurred which saw the Boers having to rather defend their own territories against the British, and it partly put paid to the Boers overrunning their land so as to annex Vendaland, which though didn’t stop the Afrikaners when coming into power to declare it too a Homeland. Langa, a suburb of Cape Town, was an African township strictly only for Africans.